I was feeling rather nautical when I put together this combination of orange and blues using Designer Solids and prints from Echo by Lotta Jansdotter. I had so much fun putting together this quilt kit and I could easily have designed a dozen more. 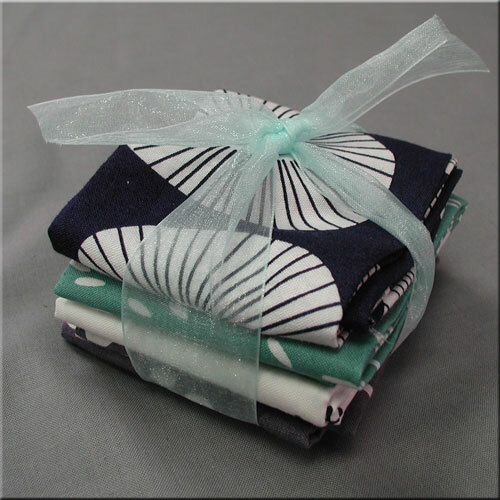 I love the flexibility to pick fabrics from different collections and to easily mix prints and solids. It's easy to drag and drop your fabric choices and I could quickly see how the feel of the quilt changed when I tried swapping the orange with agave (teal). It also seems to give a fairly good representation of the scale of the prints, at least as they relate to one another. Another nice feature is that you can choose to receive a text message when your order ships. Super important when you're anxiously awaiting your fabric purchases; ) There's also in-store pickup so I can be over in a flash when my kit is ready to go. Convenience is key! It would be nice to have more flexibility in the finished size of your quilt. The pattern I chose makes a king sized quilt while I would prefer it in a queen. Obviously I could scale down the pattern myself but I'd be buying a bit more fabric than I really need. Overall this is a fun and easy way to create your own custom quilt kit! Now to the good stuff... For my giveaway Quilter's Way is providing this lovely bundle of 4 fat quarters from Echo by Lotta Jansdotter. To be entered in the giveaway leave a comment by midnight Tuesday, January 17th. Wednesday I will draw a name and announce the winner. Don't forget to hop over to the other participants for more chances to win and definitely check out the kit designer for yourself. Thank you for the review. I'd like to win some of this fabulous collection. It's my favorite. That is a really nice combo. Hope to win! Great write up! I am going to have to go play over there. It sounds like you had some fun! I'll have to go check it out. I love this kit designer too. But I especially love the fabrics you chose. The kit designer is really fun. I had a great time playing with it with various solids, to see how the colors play off each other. Thanks for the chance! I need to check out this kit designer! ooh, i haven't seen the kit designer before. there go hours and hours... ;) thanks for the link and the chance to win! What a great way to choose fabrics...thanks for sharing this info! I can always use some fresh ideas. Love the giveaway!